Today is Friday and it is my day off, "No" cooking on Friday! I went home looking to go out and grab a quick bite but Kevin asked to have a home cooked meal tonight. He does not feel like going out so to please him I decided to make something fancy but yet easy to make. 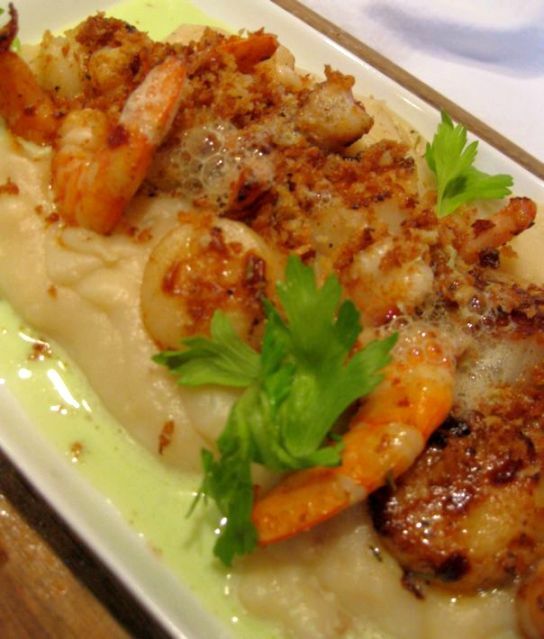 A gratiné is any dish that is topped with cheese or bread crumbs mixed with bits of butter, then heated in the oven or under the broiler until brown and crispy. 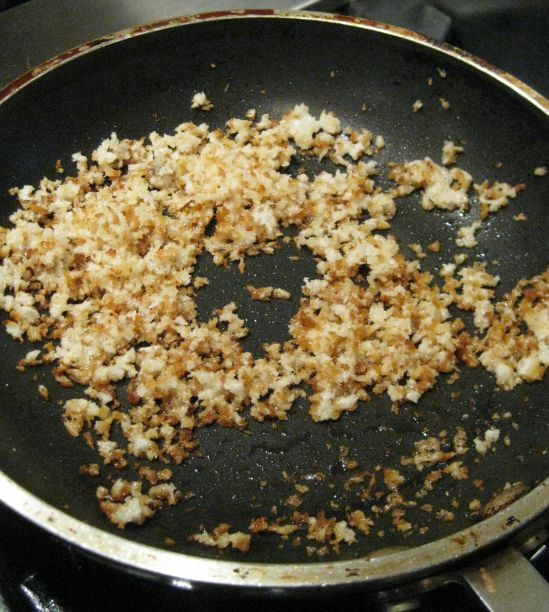 Here I just toasted the Panko bread crumbs in butter until the bread crumb is golden brown as short cut. 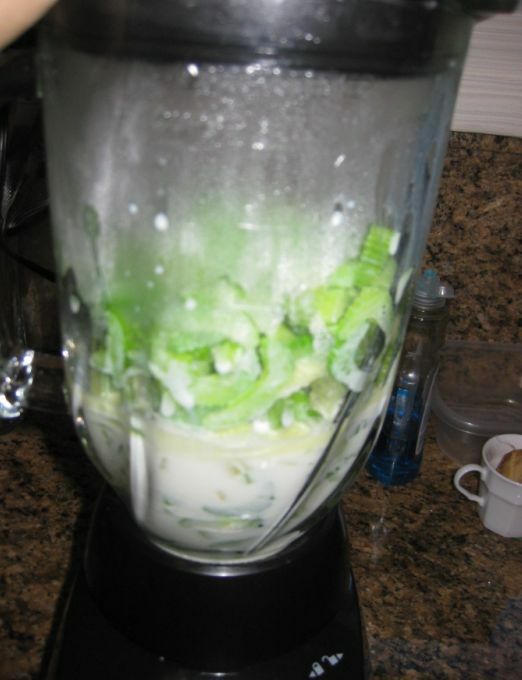 The celery emulsion is optional and therefore a lot simpler to make to leave it out. 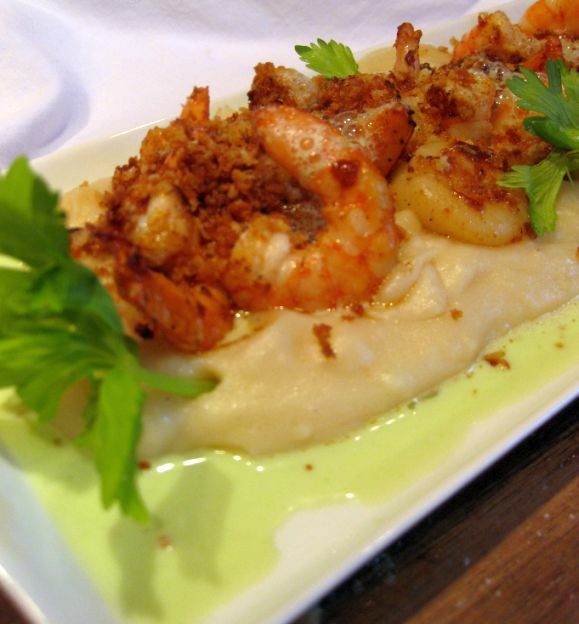 We all love this dish! 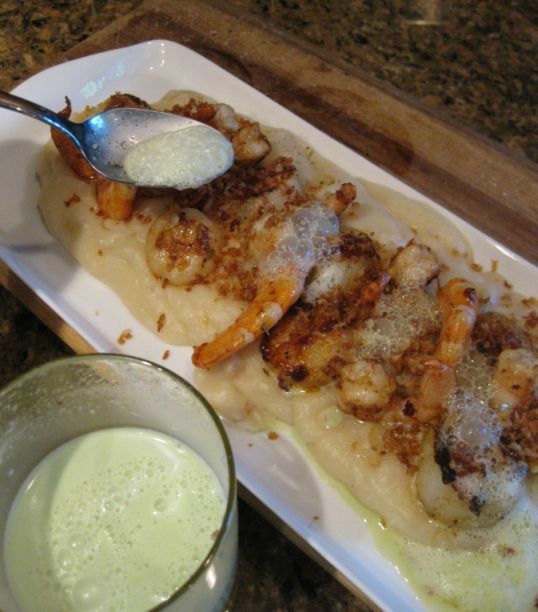 It feels like a fancy dish but it is easy to whip it up. 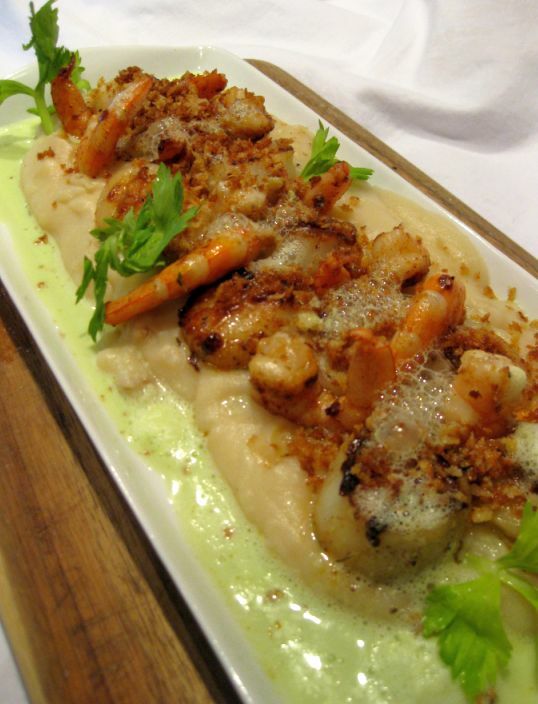 I probably will serve this dish next time I have a party but I will use jumbo shrimps instead to make is fancier. 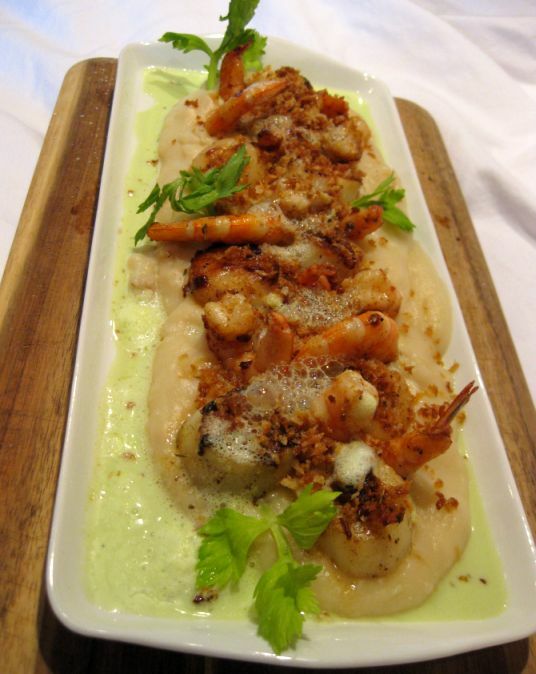 Close up look at dish! 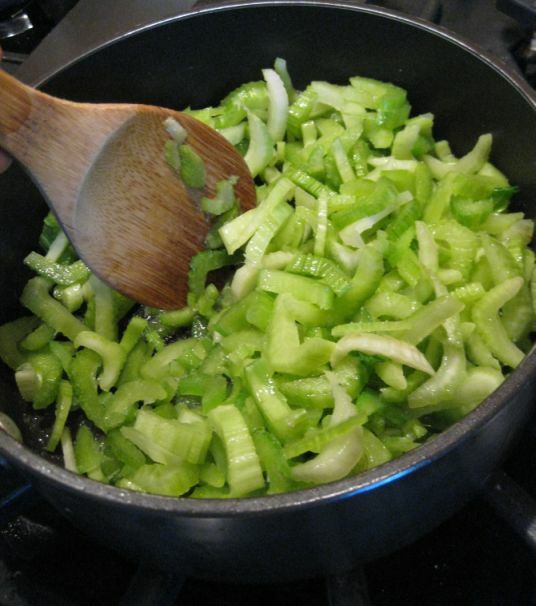 Melt the butter in a sauce pan and add the chopped the celery. 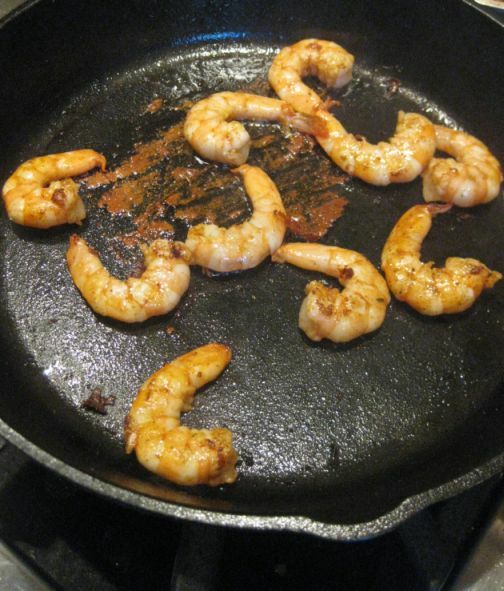 Sauté briefly to brighten its color. About 1 minute. 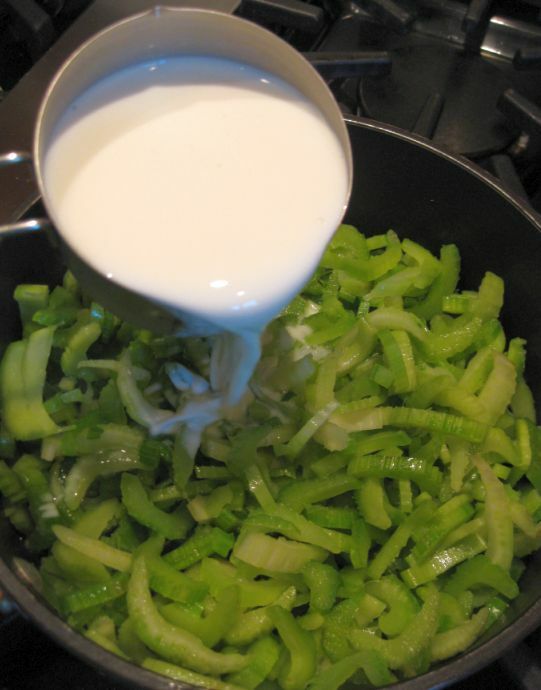 Pour the milk in the sauce pan and bring it to a boil. 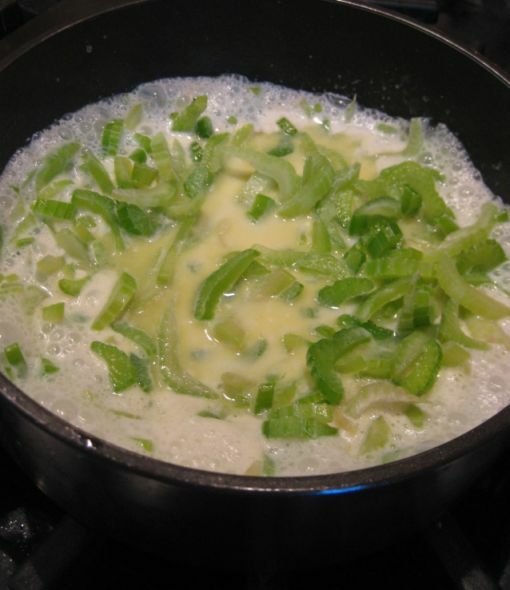 Let the milk boil for about 2 minutes or just until the celery is tender. 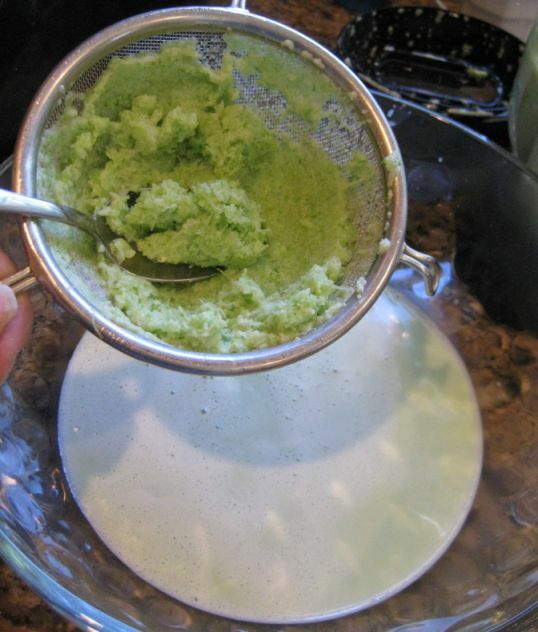 Do not cook too long or you will loose the bright green color. 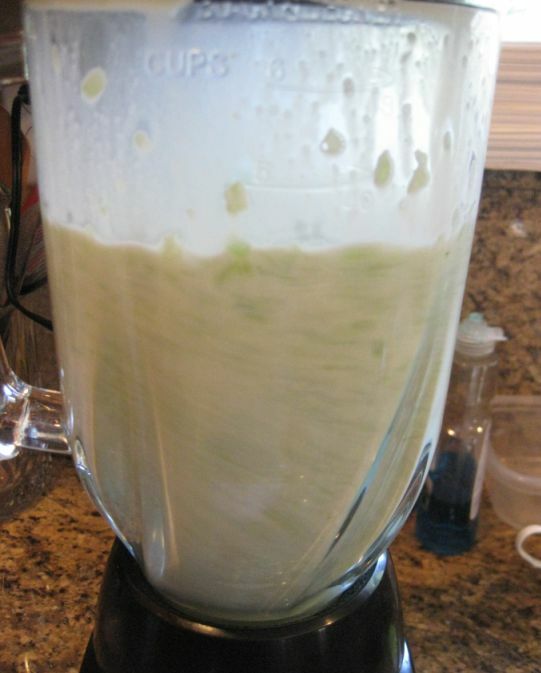 Pour the celery mixture in the blender. Puree the mixture until smooth and season with salt. Pour the mixture into a fine mesh strainer. 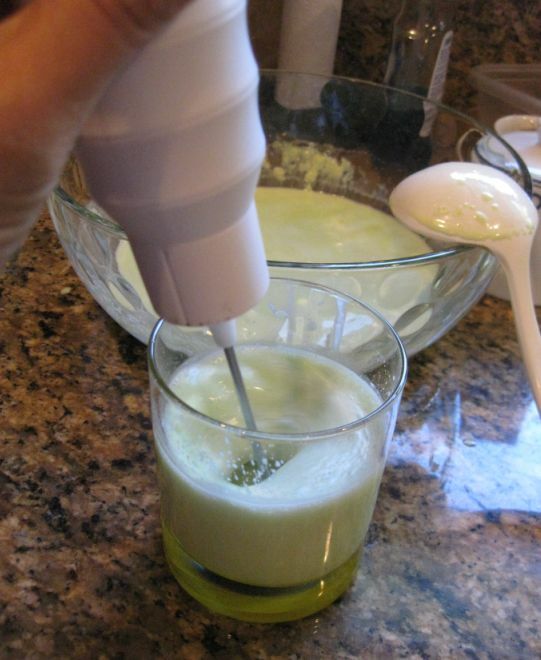 Press out all the juice you can and then throw away the celery pulp. 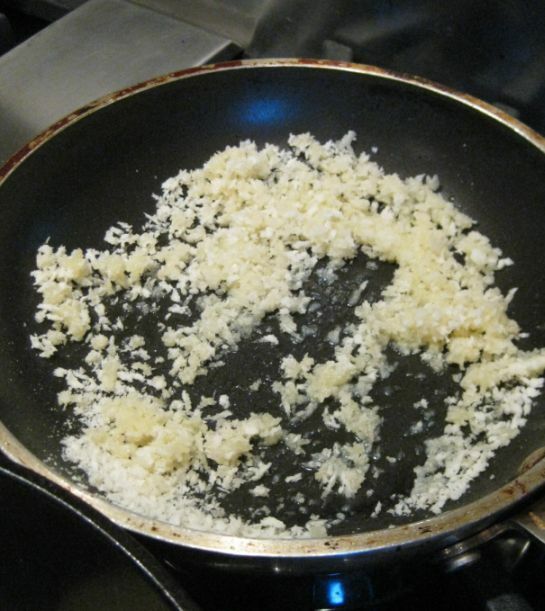 Melt the 2 tablespoons of butter in a pan and add the panko. Keep moving the bread around until it is golden and set aside. 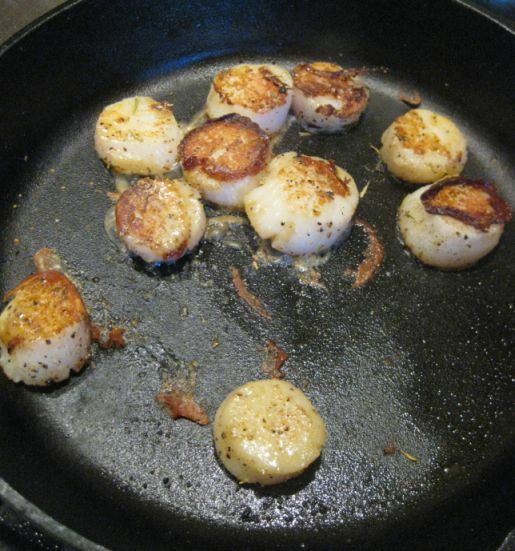 In a very not pan seared the scallops. Careful not to overcrowd your pan and make sure not to move your scallops for about 1 to 2 minutes to make sure the scallops have a nice crust on top. 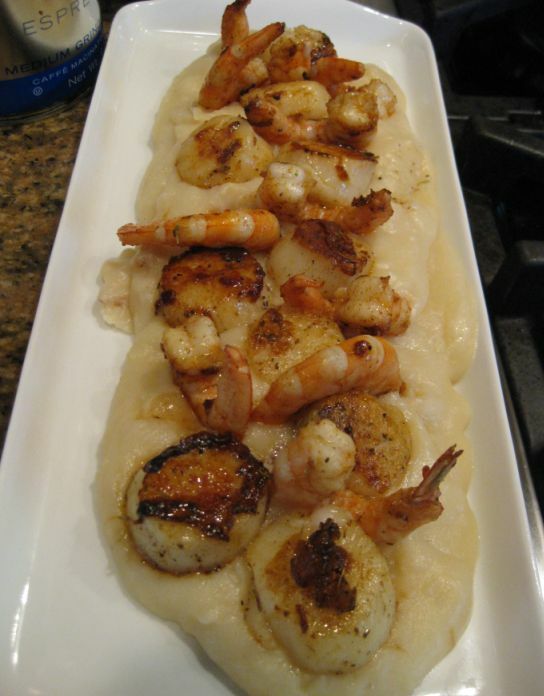 Spoon the mashed potatoes on a plate and add the scallops and shrimps on top. 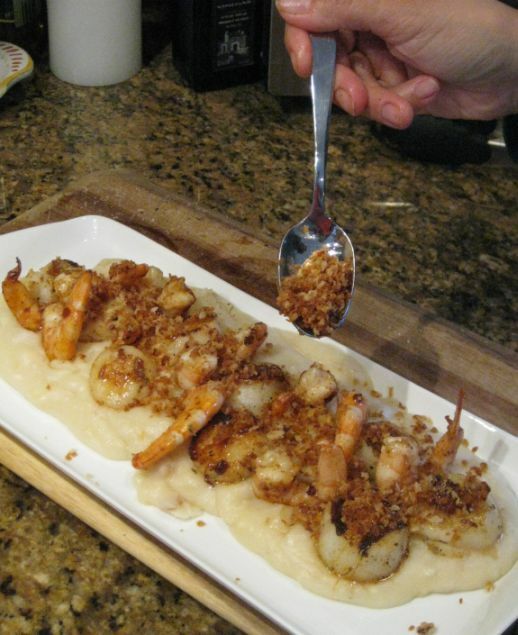 Sprinkle generously the sauté panko (bread crumb) on top of the plate. 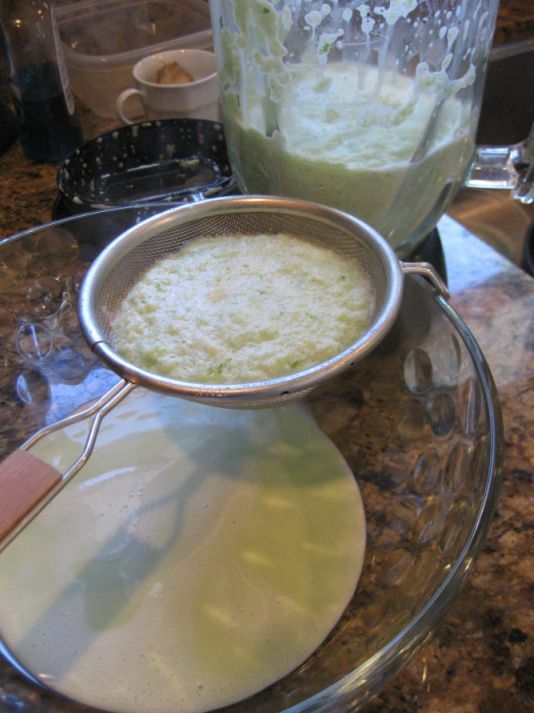 Add the celery emulsion foam on top and spoon the celery emulsion around the plate.